Working with Dr. Pat Keyser, Center for Native Grasslands Management (CNGM), and a host of local Natural Resources Conservation Service (NRCS) staff, I recently finished conducting the first two Working Lands for Wildlife (WLFW) in-service training workshops, one in Missouri and the other in Kentucky. 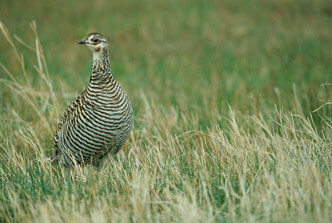 The workshops are to provide support and training for the WLFW Bobwhite in Grasslands project. 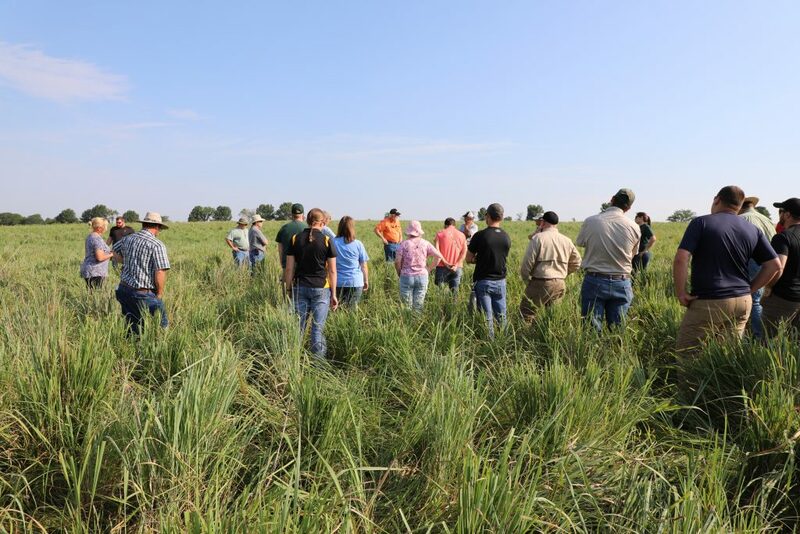 We cover some bobwhite habitat basics but really immerse participants into the reasons for using native forages, establishment and grazing management, finally integrating grazing management with grassland wildlife. The National Bobwhite Conservation Initiative (NBCI) and CNGM are under contract with NRCS to conduct seven or more (depending on how far the money goes) of these workshops in the Bobwhite in Grassland states. I’m proud to report workshop evaluation surveys completed at the conclusion of each of the workshops for the question, “Considering this workshop in its entirety, how would you rank it?” averaged 4.65 on a scale of 1 to 5. Workshops begin with an indoor presentation before proceeding outdoors. High scores are something to feel good about, but are our objectives really being met? In both instances, there were about 30 NRCS, University Extension, state wildlife agency staff and partner biologists attending. Respectable numbers and a good cross-section of participation, also a good crowd size for free and open discussion. The question that has to be asked, why not more? Was the timing poor with too many conflicts, is it a topic staff aren’t interested in? Was it because there was travel and potentially an overnight stay required? Our survey can’t get those answers, how do you survey someone who wasn’t there? In the meantime we need to figure out an effective way to get our message about integrating native forage into grazing systems and integrating bobwhite management to a larger audience. Workshops are a great way to convey the message and can provide an excellent learning opportunity. The drawback is there are only so many workshops that can be physically conducted within a defined timeframe. Recording the workshops and setting up on-demand webinars can help alleviate the problem of limited time, but typically don’t provide as good a learning opportunity as a workshop combining classroom time and field tours showing examples. With the technology available today, perhaps a live broadcast available for remote viewing and connectivity allowing questions from viewers in real time is an option. Regardless, NBCI will continue to explore the options available and meet the demand to the best of our ability and technical capability. A significant part of the workshop is challenging long-held beliefs about native forage and bobwhite habitat using science-supported facts about native forages to debunk the common myths. 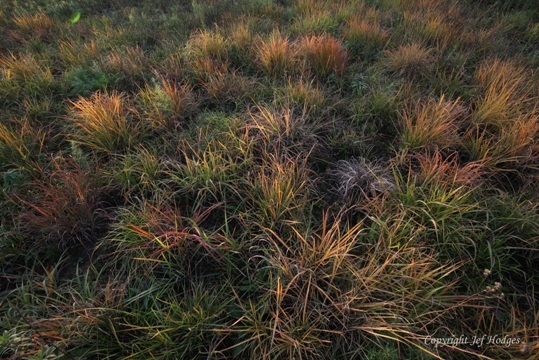 For example, everyone knows – or least has been told for years, that native grasses are difficult to establish. Not so true, The CNGM looked at their 14-year history of planting native forages and found 85% of the time they were able to establish a production stand of native grasses. Weather extremes were responsible for the majority of the 15% failures. Establishing native grasses is an agronomic practice and as long as you follow the agronomic procedures they are not difficult to establish. When weather extremes are the culprit, it doesn’t matter what you’re planting, it’s going to fail. I’ve not seen the success rate for introduced species for comparison and I’m not sure one exists, other than anecdotal. 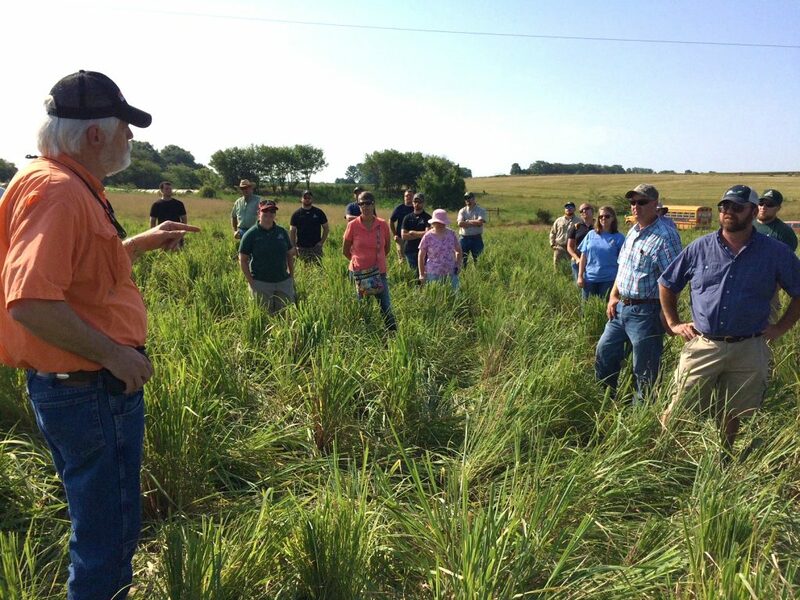 Field tours show workshop participants real-life examples of native forages in production use. growing season after planting, admittedly not at as high of level as a fully established stand, but they can provide grazing the first year after planting. 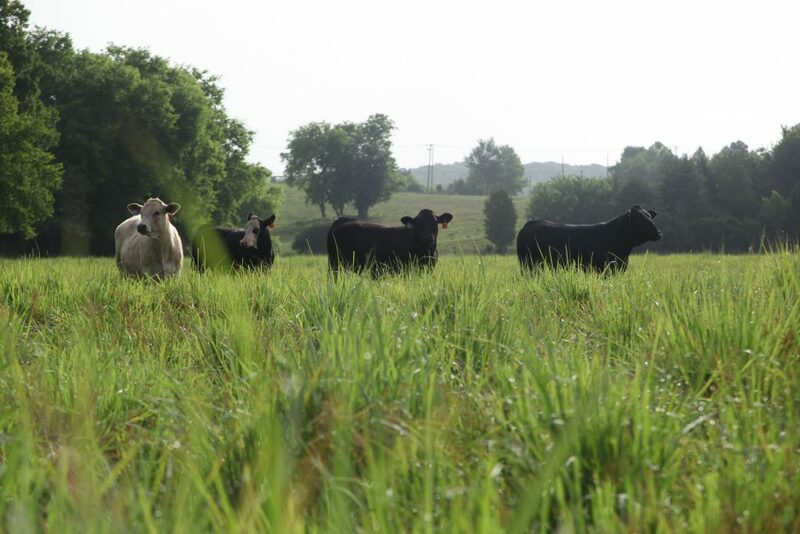 Because planting native warm-season forage is a deliberate move a grazier can plan accordingly; adjust stocking rate, paddock size or plan for supplemental feeding. Native grasses are a poor quality forage, why would a rancher want to purposely plant them? Forage quality tests of native warm-season forages don’t compare favorably to introduced species, especially when using forage tests designed for cool-season species. The ultimate test of any forage is animal performance. 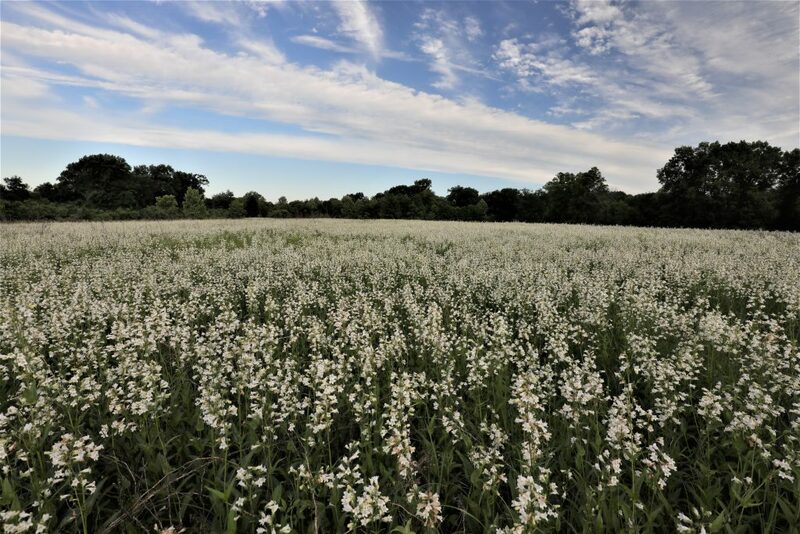 It has been well documented, over a long period of time, across multiple studies, average daily gains on native warm-season forages falls within the range of 1.5 to 2.0 pounds during the summer months. Conception rates are high, lactation is greater, average weaning weights are higher and, overall, other animal health issues are fewer. Poor quality forage doesn’t have these attributes. But they are so expensive to establish. If you are doing a prairie restoration with a complex mix of grasses and forbs, yes, they are expensive. Under a production scenario using simple mixtures, depending upon species selected and species being compared to, establishment cost can range for 20% less than introduced species to 50% more. Seed cost can, but not always, be more expensive, but when you look at total establishment cost, considering other inputs, native warm-season forages can be very competitive with introduced species. In economic analyses conducted by CNGM, including establishment cost, a big bluestem-indiangrass mixture was compared to bermudagrass and sudex for hay production, using a $65 per ton price, found a producer could recoup their investment in year 4. The producer would never recoup their investment for bermudagrass or sudex. Now consider this, steers grazing big bluestem/indiangrass provided the least expensive cost per pound of gain at 31 cents, bermudagrass at 54 cents and sudex at 75 cents. Yeah, but they are hard to manage. If you like continuous grazing, you can keep continuous grazing. Do simple pasture rotations, you can continue simple pasture rotations. Like management intensive grazing, you can keep management intensive grazing. Proper grazing, regardless of forage – cool-season, warm-season, introduced or native, is about proper forage management. The process isn’t any different, only the trigger points for decision making. Of course, proper forage management includes proper stocking rates. There are many other advantages to incorporating native warm-season forages into a grazing system, some not as easily quantified. There are advantages to soil health, water quality, soil conservation and wildlife. I think if a producer takes an unbiased look at native forages, without the interference of all the misinformed nay-sayers, they will find native warm-season forages to be a valuable addition to their grazing systems. Fescue fields in the background are brown from the drought. Penstemon digitalis the spring following an August burn and September herbicide treatment for sericea lespedeza. 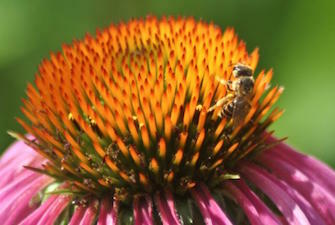 … then I have pollinator habitat! The field pictured, I presume, is the result of my sericea lespedeza management program. The field has a serious infestation of sericea lespedeza, which I have been haphazardly trying to control the past few years until last year. Last year the infestation became severe enough I decided to get aggressive with it or fear losing it to total dominance by sericea and loss of significant habitat value. The field was burned the second week of August and patches of sericea that didn’t burn because they were too thick, were mowed. I followed that up with an herbicide application of PastureGard HL at the rate of 1 pint per acre in late September. 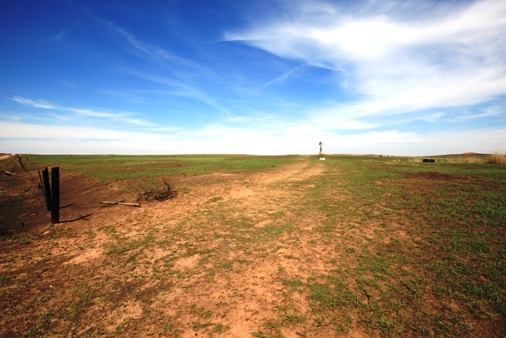 The above image is what the field looks like this spring. Admittedly, there was penstemon present before sericea treatment but not at this density. The questions in my mind are: Did killing the sericea release the penstemon? Did burning in August stimulate the penstemon? 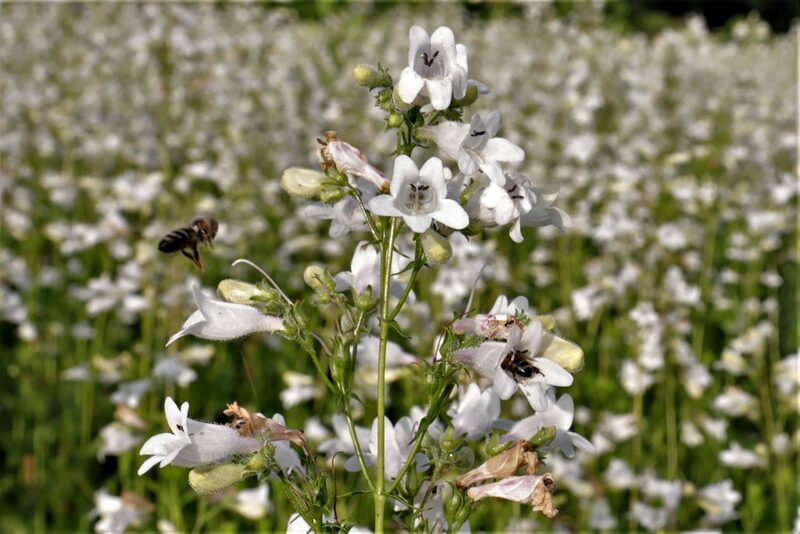 Is penstemon tolerant to PastureGard HL? Or all of the above? All questions I hope to learn the answers to over the next few years. The good news, upon casual observation, I got 90 – 95% control of sericea. There are still plants there but some targeted spot spraying will keep the sericea in check – for this year. Bees visiting penstemon flowers. I guess this answers the question. After photographing the penstemon I took a look around at a few other native plants flowering on my farm. Spiderwort has always intrigued me. Most folks I know call it spiderwort but there are a couple of common names used that I think best describe the plant, a.k.a. snotweed or cow slobbers. When the stem is broken it oozes a clear, viscous sap that resembles . . . one of its common names. I really think cow slobbers is the best descriptor. 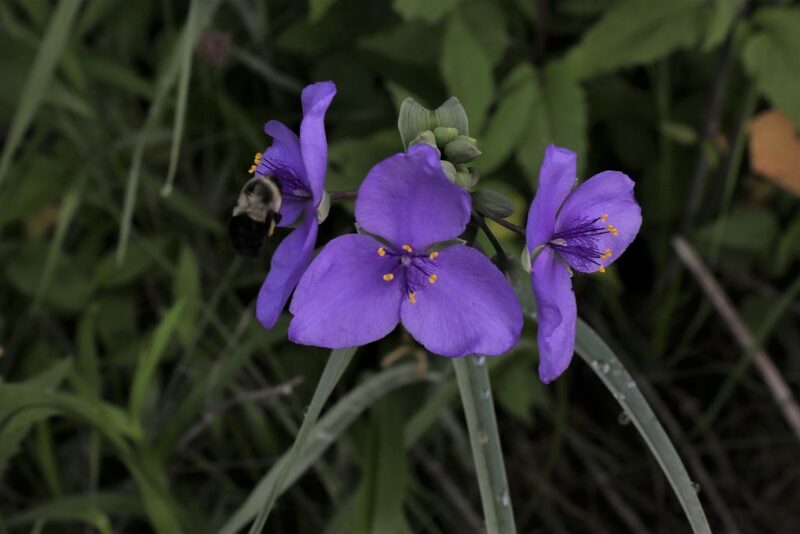 There are several species of spiderwort and, of those, they can be basically divided into two different categories, one group of species adapted to woodland settings and the others to open grasslands. Spiderworts are used by a number of pollinators. 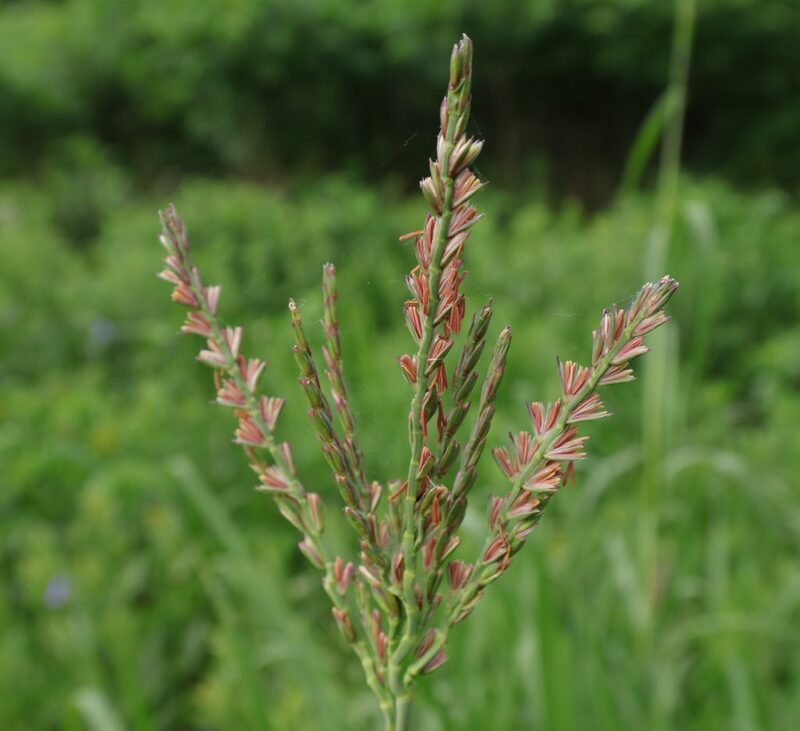 Eastern gamagrass is a perennial grass that is a distant relative to corn. Like corn, it is monoecious, having separate male and female flowers on the same plant, but unlike corn, both are on the same spike. The photographs below show the stamens and stigmas. The timing of the photographs just happens to be of only stamens and stigmas. Both will be expressed on the same seed stalk within hours or a day. 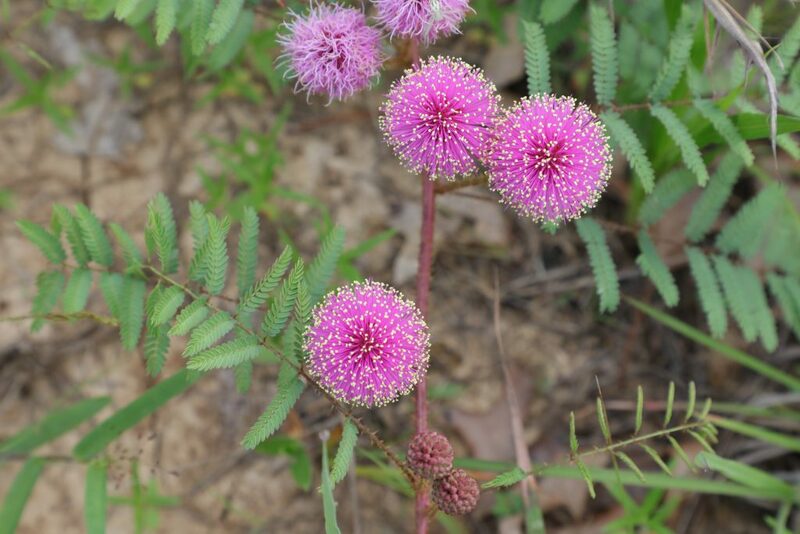 Sensitive briar or cat-claw sensitive briar has an interesting bloom, the pink florets arranged to form a pink ball, with each floret tipped in yellow. Close examination of the “thorns” show they are shaped like a cat-claw and if you’ve ever inadvertently walked through them in the prairie you understand how this plant got one of its common names, devil’s shoestrings. In summer, when the seed pods ripen and dry, they will twist and split open, expelling their seeds on the ground. Collecting their seed can be a challenge, one because of the “cat-claws” and two your timing has to just right or the pods have burst open and shattered all their seed. The folding leaves of sensitive briar are fun to show kids why this plant got its name, when they fold up upon touch. 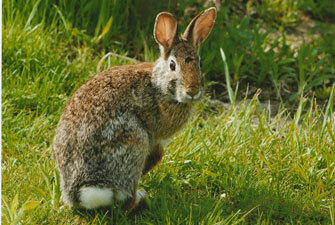 Livestock and deer browse the plants; quail, other birds and rodents eat the seeds. Things are happening in the prairies and grasslands this time of year. Get out and enjoy the wildflowers and wildlife. 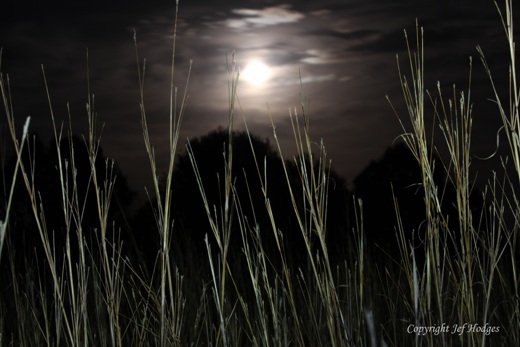 Native Grass Gazette: The Longest Excuse Ever! I told myself at the beginning of the year I would do a better job of writing blog posts, trying to write one a month or at least one every two months. Well, here it is April and this is my first post of 2018. Time has simply gotten away from me, but I haven’t been remiss in my duties (other than writing a blog post). These first three months have been busy, mostly with Natives First, but there are also a lot of other things going on. I thought I’d take this post to catch you up on a few of those things. I started out the year wrapping up a project that began last year. Through a Natural Resources Conservation Service (NRCS) agreement with Pheasants Forever, NBCI and the Center for Native Grasslands Management received an award (originating from NRCS) to conduct a series of technical transfer workshops about establishment, management and grazing of native warm-season grasses for bobwhites in support of the Working Lands For Wildlife Bobwhite in Grasslands (WLFW BIG) project. The workshops will have two components, first is an in-service training for NRCS staff, NGO partners, Extension and state wildlife agency personnel. The second component will be producer oriented to introduce producers to native warm-season forages and their management. 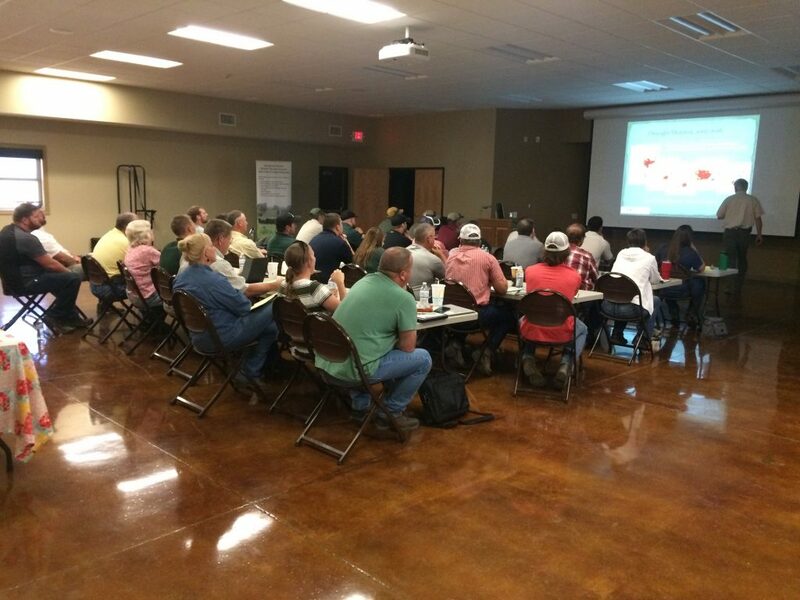 Requests for workshops will originate from the NRCS State Offices in the WLFW BIG states (AR, IL, IN, KY, MO, NC, OH, TN, and VA) interested in hosting one. These workshops will be completed over the next 3 years. While on that subject, as part of the coordination team for BIG, I developed draft technical content for a Northern Bobwhite story board. (It is being modeled after a Monarch story board http://nrcs.maps.arcgis.com/apps/Cascade/index.html?appid=8c9b052d51214cc3b6742a4ddf0a98cc) Other members of the coordination team have been reviewing and editing the story board as well as identifying photographs and images to include. NRCS National Headquarters Public Affairs department will handle the graphic development and distribution. I hope it will be out by May. 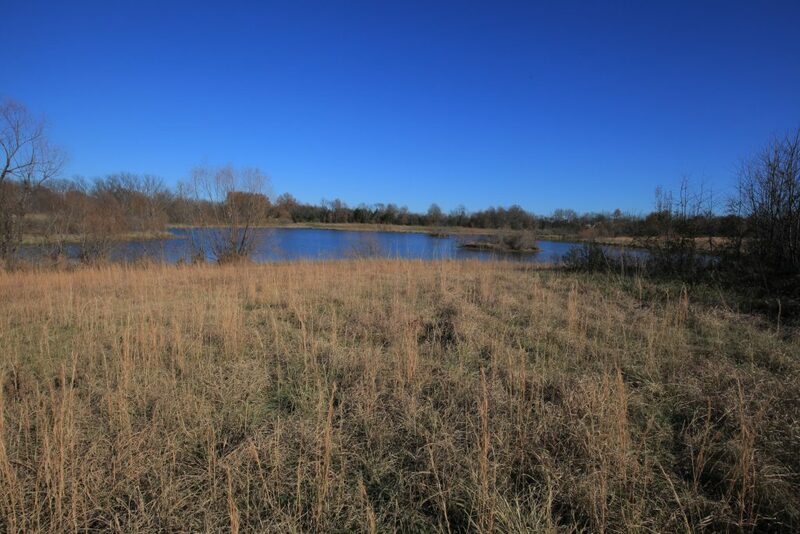 The purpose will be to promote the WLFW BIG project, primarily prescribed grazing of native forage for bobwhites. As I mentioned, Natives First activities have been monopolizing most of my time. In January, I established a Natives First Facebook page https://www.facebook.com/natives1st/. For those who are Facebook savvy, that may not sound like much, but for me there was a learning curve. I originally published a personal Natives First page, then discovered I should have published a community page, which I did after some investigation into why the original Natives First page wasn’t working the way I wanted. Rookie mistake, right? A lot of the Natives First activity has been providing follow-up to questions and comments. Some to several members of congressional staff, other to NGO’s curious about the proposal and investigating whether they want to support Natives First or not. One of the most common concerns is what impact Natives First will have on the use of non-native plant material when there are justifiable reasons to use non-native. My first response is, it is a natives “first” proposal, not natives “only.” My second response is, if Natives First is implemented as NBCI suggests, each State Technical Committee will determine which non-native plants can be used under what circumstances. Another question that has arisen is about seed availability and cost. Having worked in the native seed industry I know that seed companies will respond to increased demand. Seed producers are understandably reluctant to expand production of a crop without knowing there will be a somewhat predictable demand. Natives First will help provide predictability, which will stimulate production and stabilize supply and prices. I have been working with the American Seed Trade Association (ASTA) since the beginning, keeping them informed. In fact, an ASTA member worked to help develop the language in the Natives First proposal as it relates to seed, sourcing and availability. Natives First seems to be gaining some momentum … if not momentum then certainly recognition. In February, Tom Franklin, NBCI’s Ag Liaison, and I worked with an outdoor writer providing background and information for an article about Natives First. 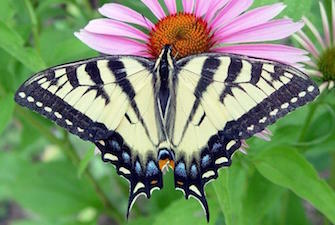 In late March, Ensia Online published the article by Andy McGlashen, A U.S. Farm Bill Even A Butterfly Could Love? https://ensia.com/articles/farm-bill/. We have received quite a bit of feedback from that article and continue to follow-up on inquiries. In support of Natives First, on March 1 I presented a webinar, Native Vegetation Investments Pay Conservation Dividends, on Sothern Regional Extension Forestry’s Webinar Portal for Forestry and Natural Resources. It was live viewed by nearly 100 and is available as View on Demand at: http://www.forestrywebinars.net/webinars/native-vegetation-investments-pay-conservation-dividends. This was my first webinar and combined with the technical nature of the content, preparation was very time consuming. Alyssa Merka, NBCI communications specialist, is working with me developing several one-pagers to help promote Natives First, one being an infographic promoting native vegetation. More accurately, I should say I am working with Alyssa, as she is doing the hard work designing and organizing the documents. 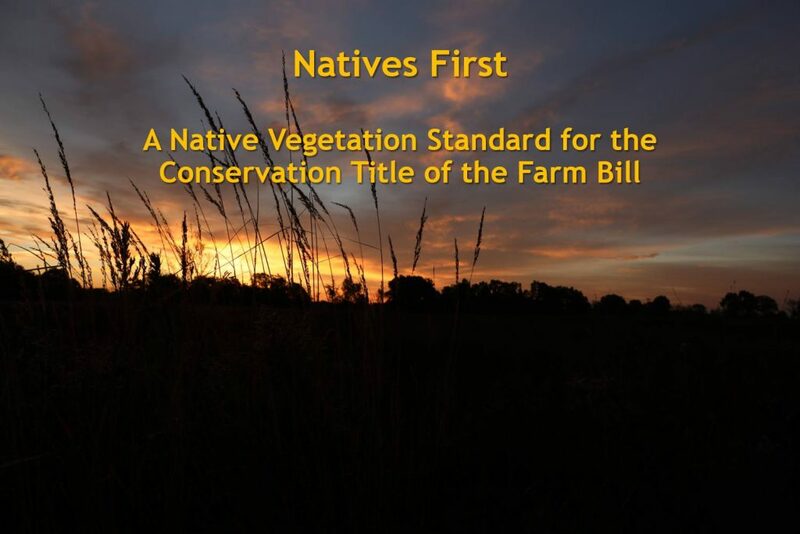 The objective is to have brief, succinct facts and descriptions to give readers a quick look and understanding of NBCI, Natives First, the Natives First Coalition and why we are promoting native vegetation. We’ll make an announcement and post them online when they are done. Promotion of Natives First continues this month. The second week of April, Tom Franklin, NBCI Forestry Coordinator Steve Chapman and I are headed to DC and will be making the rounds at UDSA, USFWS, USFS, BLM and meeting with a couple of members of Congress carrying the Natives First message and discussing NBCI’s agenda for early succession management of forests, thinning and burning, grazing as a management tool and, of course, utilizing native vegetation. It hasn’t all been about office work. In mid- January I attended an Adaptive Multi Paddock (AMP) grazing workshop conducted by Dr. Allen Williams. We had a meeting scheduled to delve into detail about the “adaptive” part and how to adapt it for bobwhites. Unfortunately, icy weather cut Dr. Williams trip short and we were unable to meet. We’ve rescheduled for mid-April. Stay tuned for the results. A few days later I attended the American Forage and Grassland Council (AFGC) annual meeting in Louisville, KY where I met with their board of directors. The purpose of that meeting was to introduce NBCI to AFGC and inform them of our support and promotion of prescribed grazing of native forages … and to ask for an advisor to provide technical input to me on grazing matters. An unexpected but welcome result of that meeting is that NBCI is tentatively scheduled to sponsor a grazing and bobwhites symposium at their 2019 annual meeting in St. Louis. This represents the first, to my knowledge, entry by any wildlife interest into the core of the forage production livestock industry. On the heels of that trip I met Don McKenzie, NBCI director, in West Virginia where, on a blustery, snowy day we toured a potential bobwhite recovery site with WV DNR personnel to give our assessment of habitat condition and readiness for translocations. Following our field tour, the next day, we met with the WV governor to inform him of our assessment. 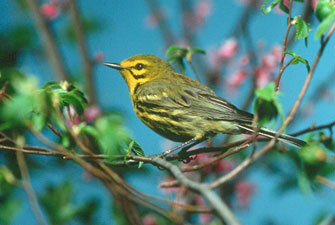 WV Governor Justice has a keen interest in seeing bobwhites recovered in the state. The last days of January and first couple of February I traveled to Sparks, NV to attend the Society for Range Management annual meeting where I gave a presentation on the Importance of Southern Rangelands to Northern Bobwhites and Other Grassland Birds as part of a Forgotten Southern Rangelands Symposium. You are probably wondering what that has to do with my job duties? Currently, USDA only recognizes “rangeland” in Florida of all the south/southeast. There is an attempt underway to get USDA to add the official designation of rangeland to those southern states. This change will affect practices and cost-share assistance available. 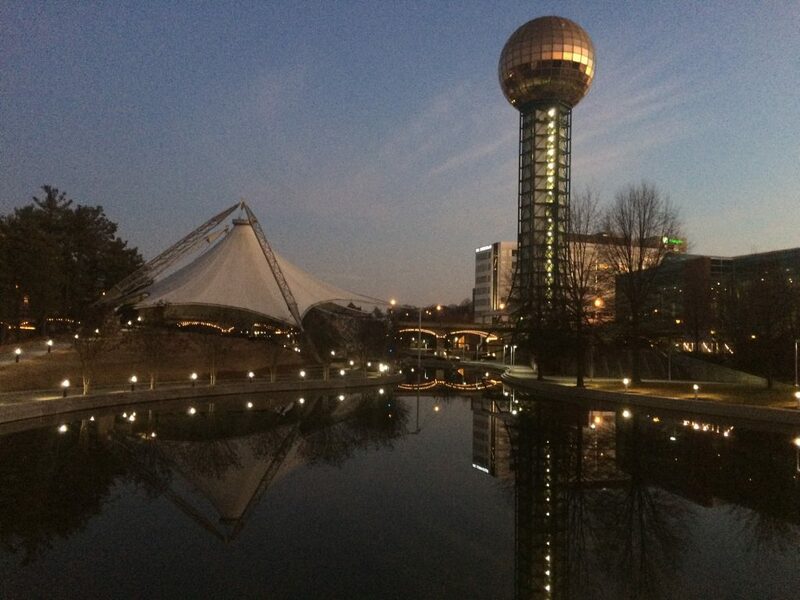 The third week of February, I attended NBTC Steering Committee and NBCI Staff meetings in Knoxville. On the grazing front I’ve been reviewing grazing allotment management plans and annual operating instructions for the Ozark and St. Francis National Forests as we look for ways to make grazing more wildlife/bird friendly on those forests. I’ve also provided input and review of grazing/wildlife presentations or study designs for Ohio NRCS and KY Department of Fish and Wildlife Resources. Intermingled among all of this I have been working slowly, but steadily, on the two Grazing Strategies for Northern Bobwhites publications, the western landowner-focused version and eastern, technical assistance-focused version. I’ve been conducting a literature search and review, reading common articles, interviewing grazing managers and researchers, all trying to wrap my head around all of it. Those publications are forthcoming. So you can see, I really have been busy and haven’t had time to write a blog post. Native vegetation filters more nutrients and coarse sediments from runoff than introduced grasses. 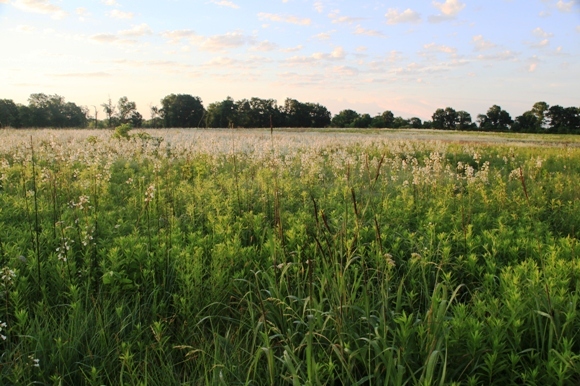 Native warm-season grasses provide excellent summer forage. The sportsmen’s organizations were joined in their support by 21 other NGOs, private enterprise and industry organizations (see list below). Senator Bennet is drafting a grasslands marker bill to be introduced as part of the Farm Bill discussion. The letter was followed by calls with Senator Bennet’s office and staff of the Senate Agriculture Committee in which NBCI staff discussed the intent of the proposal and answered questions about why native vegetation was preferable over introduced species. At the request of the Senate Ag Committee staff we shared the Native Vegetation Advantage documents: Overview; Water, Soil and Air; Forage and Biomass; and Wildlife. In addition to Senator Bennet and the Senate Agriculture Committee staff, we are also sharing the letter with House Agriculture Committee staff and all agriculture staff of members that serve on the Agriculture Committees. 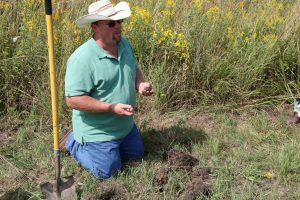 Drexel Atkisson, NRCS, explains “crumbly” soil under native vegetation indicates healthy soil. Of course, this is only the first step of a long journey to passage of the Farm Bill. Why is it important that preferential treatment of native vegetation become part of the next Farm Bill? One of the answers is to reverse the decline of grassland birds and pollinators, which is inextricably tied to the quality of grassland habitat. Another answer is that funding in the Farm Bill has the ability to create landscape-scale change impossible through any other means. For example, in the years 2009 through 2014 the Environmental Quality Incentives Program (EQIP) enrolled an average of nearly 1.9 million acres annually. In 2014, it is estimated that 66% of the EQIP acres (1.25 million) were enrolled in introduced vegetation. 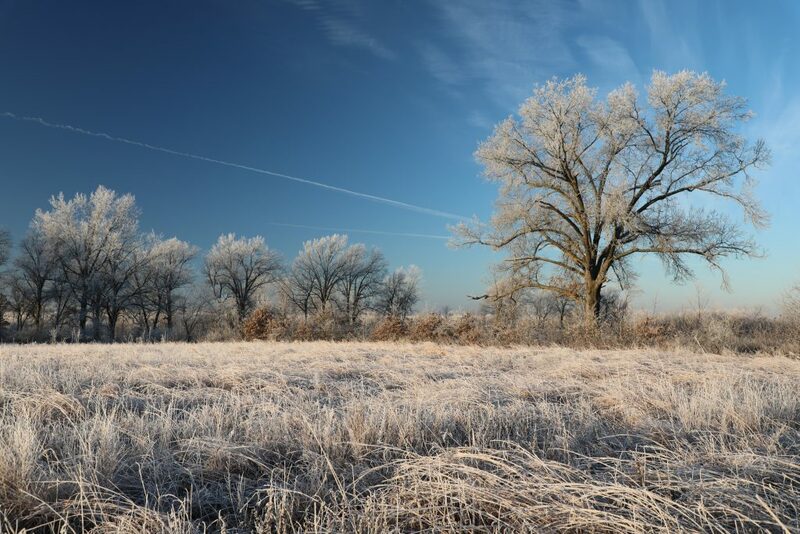 While those enrollments do provide some soil conservation benefits, it is well documented that native vegetation can provide at the very least, equal soil conservation benefit but BETTER soil health, air quality and wildlife benefits. For all those additional benefits it then becomes an economic argument. Native vegetative cover provides more bang for your buck. It is the better taxpayer benefit. In these early stages of the formulation and foundation of the next Farm Bill it is important that we garner bigger and broader support for the Natives First concept. Quickly. That’s where YOU come in! Help us spread the word and build support! Help us educate! Many in the ag community are reluctant to support native vegetation simply because they are uneducated about its many benefits above and beyond those of introduced species. Others are under the misconception that all grasses are the same and don’t recognize the differences. Public education, Congressional education, industry education and institution education is needed. We need your help. Please join the Natives First Coalition at: https://bringbackbobwhites.org/conservation/natives-first/. Utilize the Native Vegetation Advantage documents NBCI has made available for your use (Overview; Water, Soil and Air; Forage and Biomass; and Wildlife). You can help spread the word about the benefits of Natives First through whatever communication platforms you have available, whether a website, a blog, a Twitter account, email “action alerts,” etc. Rosinweed (Silphium integrifolium) blooms protruding through sericea lespedeza invasion. Producing one to three million seeds per acre and remaining viable for what is thought to be up to 20 years in the soil, the seed rain alone creates an ever-abundant seed bank. Once established, plants will reduce or eliminate competing vegetation through shading, competition for water and nutrients and allelopathy. Introduced in 1896 at the North Carolina Agricultural Experiment Station to be tested as an agricultural crop, sericea lespedeza (Lespedeza cuneata) also known as Chinese lespedeza or Chinese bushclover, made its first recorded entry into the United States. In 1924, the US Department of Agriculture, using seed from Japan, planted it at the Arlington Experiment Farm in Virginia. Sericea lespedeza was commonly used for ground cover in mine reclamations and road construction particularly due to its adaptability to poor soil conditions. In the 1940’s USDA and many state agencies promoted sericea for forage, hay and wildlife food and cover. Reported in 2005, by C.A. Duncan, et al, Invasive plants of range and wildlands and their environmental, economic, and societal impacts, the estimated coverage of sericea lespedeza was 8.6 million acres in 2003. The authors also reported from a study site in Kansas that between the years 1989 – 2003, sericea had increased at a rate of 24% annually. I do not contend that the rate of increase is 24% annually range-wide, but it does demonstrate that sericea lespedeza has the capacity to overwhelm natural systems rapidly. Sericea is best adapted to areas of 30 inches of rainfall or greater and is tolerant of minimum temperatures down to -15◦ F. Figure 1 shows the approximate area of adaptation, though it is known to exist outside of the area indicated, however in limited distribution. If you don’t have sericea your best strategy is to be diligent about scouting and treat it as soon as you see it. You can’t do much about the natural source of spread by animals, but be mindful of the human sources of spread. 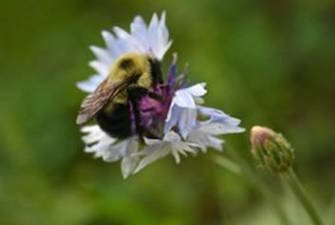 Cars, trucks, farm equipment all can capture seeds in the nooks and crannies then fall out to infest unoccupied areas. 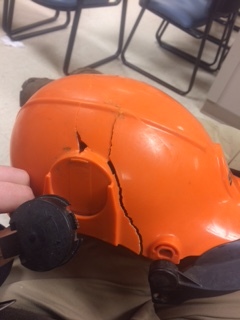 Mowing and haying equipment are particularly susceptible, miles and miles of highway rights of way have been contaminated by mowing after seed set. Thoroughly clean any equipment that has been in sericea infested fields. Pay attention to hay being hauled in, when buying, insist that it be sericea free. Don’t buy cattle from sericea infested pastures or farms. Seeds can be entangled in their coats and also pass through their systems to be deposited with manure. When buying forage or habitat seed, relying on the seed tag analysis may not be enough. Depending upon what state you are in, sericea lespedeza may or may not be listed. It is a state noxious weed in Kansas and Colorado so it is required by law to be listed. Other states, under the “Weed Seed” section of the tag, may list it while in other states it may just be part of the percentage of unknown “Weed Seed” and unlisted. Also check the “Other Crop Seed” section of the tag as some seed companies commercially sell it. It is best to specifically ask if the seed vendor guarantees it to be free of sericea lespedeza seed. I would avoid buying native grass or other seed from any vendor who sells sericea lespedeza seed for fear of cross contamination. If you have sericea lespedeza, controlling it is a challenge and a never-ending task. Even if you can eliminate established plants and seedlings, one study deduced that spring germinating seed may only represent 1% of the total soil-stored seeds. Based on that estimation, once you have it, you can plan on having it essentially forever. Grazing, mowing, burning, hand weeding and herbicide provide varying degrees of control, better called suppression. In most instances an integrated approach will yield the best results. Grazing – For the most part, livestock do not graze sericea due to its high tannin content, or it is among the least preferred so last to be grazed. 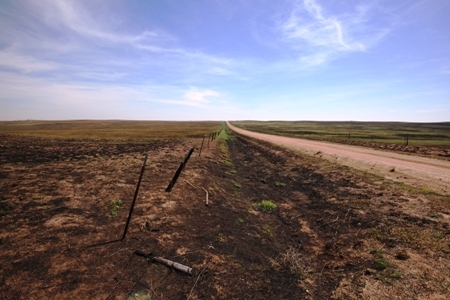 The regrowth of sericea following a burn is palatable and grazed but quickly grows beyond palatability, likewise early emerging plants are grazed too, however if residual stems from the previous year persist, cattle are less likely to graze it. Some exceptions are in high stock density grazing systems, when cattle are forced to graze it – and may be a good strategy for management. Most studies report that sericea does not increase under grazing. Also, note that goats and sheep seem to do fine with sericea. Mowing – Mowing during bloom does nothing to weaken the plant but it does prohibit it from going to seed, for the most part. Often, mowed plants will re-bloom and attempt to produce seed. If you have a late frost, they may produce viable seed. Mowing when carbohydrate reserves are low can help reduce vigor and annual mowing can reduce the stand, assuming you are also mowing during bloom to prevent seed-set. Lowest carbohydrate reserves are typically early-summer, after green up in spring. Continued mowing during the summer will continue to stress the plants and reduce their vigor. 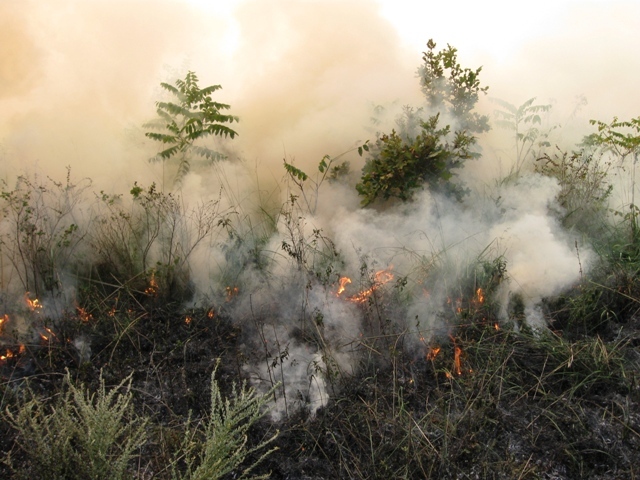 Burning – Timing of prescribed fire has varying impacts on sericea lespedeza and can increase plant density and vigor. Spring burning stimulates sericea, which if done by itself is not a good strategy. Burning helps scarify seeds and stimulate germination, however if done in conjunction with other methods such as herbicide, grazing or mowing, can be effective. Burned plants are more palatable and burning removes residual stems which inhibit grazing. Because burning stimulates a flush of new seedlings, herbicide treatments following can help reduce the seed bank pressure while also eliminating established plants. The same principles for mowing following burning apply as listed above. 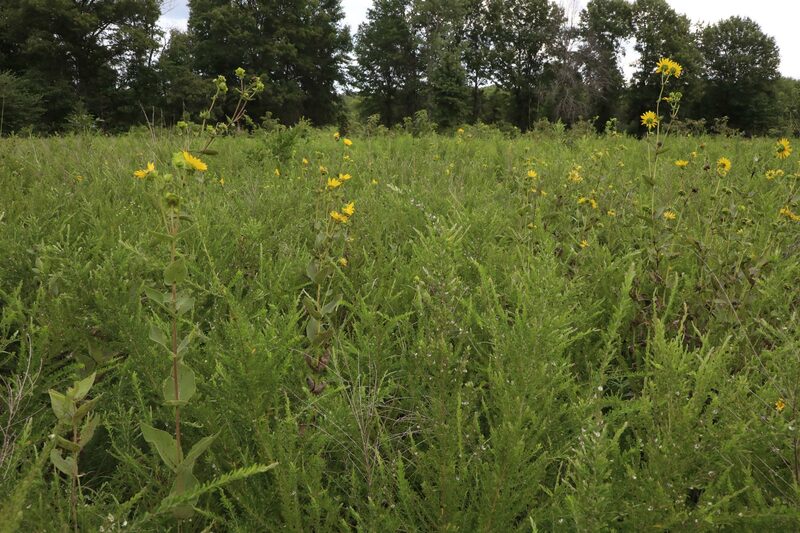 Recent research conducted in the Great Plains have shown a reduction in sericea lespedeza with repeated annual growing season burns conducted when sericea is in peak bloom. It should be noted that successive burns may not be possible with heavy infestations of sericea due to lack of ground level fuel to carry the fire. Hand weeding – Hand weeding is only effective for new seedlings. Established plants have a significant tap root and are next to impossible to pull out of the ground. Hand weeding would only apply to very minimal plant infestations on a very small scale due to the labor intensity. Herbicide – Herbicide as a stand-alone practice is probably the most efficient but it has its drawbacks. Herbicides that are specific to sericea lespedeza do not exist. The common and less expensive broadleaf herbicides, (2,4-D, dicamba, picloram) are not effective. Glyphosate can be used but is not recommended because it is non-selective. Triclopyr, metsulfuron and triclopyr plus fluroxypyr are the most effective and cost efficient, but still expect chemical cost to be between the upper teens to low twenties per acre. All three have slightly different specifics about their use in relation to their rate and timing of application. In many cases broadcast applications are not desirable due to the presence of other favorable forbs and off-target damage, while spot applications are more targeted they can also result in off-target damage and are more time consuming. Broadcast applications are best suited for heavy infestations or in stands without forbs. 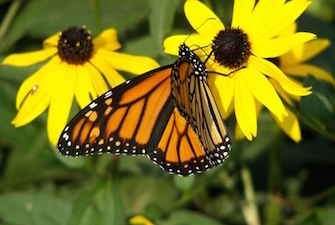 Spot application works well for scattered plants or where other sensitive, desirable plants occur such as remnant prairie or in pollinator plantings. An integrated approach to sericea suppression provides the best results. Combining burning with grazing, mowing or herbicides significantly reduces the population. In organic systems, burning with grazing and/or mowing can provide acceptable results. If you don’t have sericea lespedeza do everything you can to keep from getting it. If it shows up, get on it immediately, don’t wait for it to get to a threshold level before implementing management. Once you have sericea lespedeza, you are always going to have it. Be diligent in your sericea management strategy, don’t skip a year. You may be able to lessen effort in certain years based on plant population but don’t skip a year. Use an integrated approach for best results. Get mad, no, get angry at sericea lespedeza and attack it with a vengeance and don’t let up. It certainly isn’t going to let up on its invasion. Heinous invader. I had the joy and privilege of filming and producing the Firing Up Your Beef Production video. Aside from being an avid hobby photographer, which is one reason why this project was so enjoyable, I met some of the most genuine, sincere and interesting people. During the interviews, it was obvious each and every one, in their own unique way, had a passion for what they were doing and the land they were on. This has been a rewarding project. If you were a ranch owner and cattleman in the Great Plains and there was one thing you could do to halt and/or reverse woody encroachment, increase your carrying capacity, increase water availability, increase animal performance, increase forage quality and quantity, reduce parasites, improve grazing distribution, improve range health and protect against wildfire, would you do that one thing? According to the ranchers and researchers interviewed in the recently released NBCI video, Fire Up Your Beef Production – A Ranchers’ Perspective of Prescribed Burning for Range Management, that is precisely what prescribed burning does. Ranchers who are using prescribed fire on their ranches to improve their beef production shared their experiences for the filming of Fire Up Your Beef Production. It became apparent after the second interview there was a common theme developing … all the ranchers, in their own way, were saying the same things about woody encroachment control, water availability, carrying capacity, forage quality and quantity, range health and other topics. It was a script that was writing itself. The focus of the video is on the ranchers but researchers were included to throw a little science in for those who want to hear that aspect, though in the real world most folks find those ranchers who are practicing what they preach to be very credible and, in the end, this video is targeted to ranchers. …then how can you go wrong? Ranchers are telling their own stories of how they use prescribed burning on their own ranches to improve their operation. These testimonials are sure to resonate with other ranchers who view this video. The National Bobwhite Technical Committee’s Grassland and Grazing Lands Subcommittee charge in developing this video was to target it to ranchers, knowing if prescribed burning is implemented along with grazing management, bobwhites and other grassland wildlife will benefit. Wildlife enthusiasts are likely to ask why there isn’t more about bobwhites or wildlife in the video. Again, wildlife managers and bobwhite enthusiasts are not the target audience for this video, though there is plenty a wildlife manager could learn from hearing these landowners tell their experiences. Keep in mind, ranchers trying to make a living are the target audience. Moving outside of our traditional NBCI promotion circles, cattlemen’s associations, grazing lands coalitions, associations of Soil and Water Conservation Districts, prescribed burn associations and several other groups received the news release announcing the video, and, of course, our traditional network of contacts. The video, in both long and short versions, is available for viewing at https://www.youtube.com/user/BringBackBobwhites/videos. Entities interested in obtaining copies for group screenings may contact Alyssa Merka at amerka@utk.edu for copies on DVDs or flash drives. 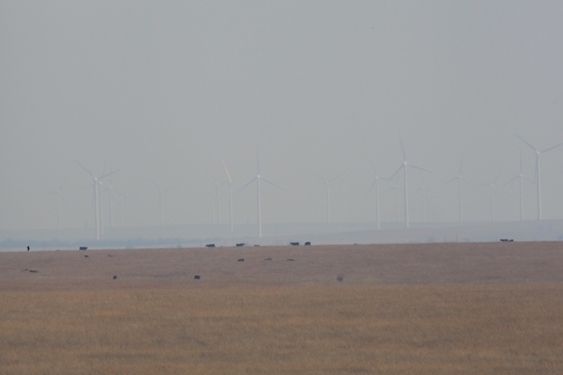 This project wouldn’t have happened without the cooperation of the ranchers, but there were many other people involved in the background who coordinated site visits for filming, set up the interviews, provided drone footage, answer the call for “b-roll,” reviewed our effort and provided quotes for our news release, and on and on. I am going to attempt to list everyone who had a hand in this project in one way or another. I apologize in advance for any omissions. 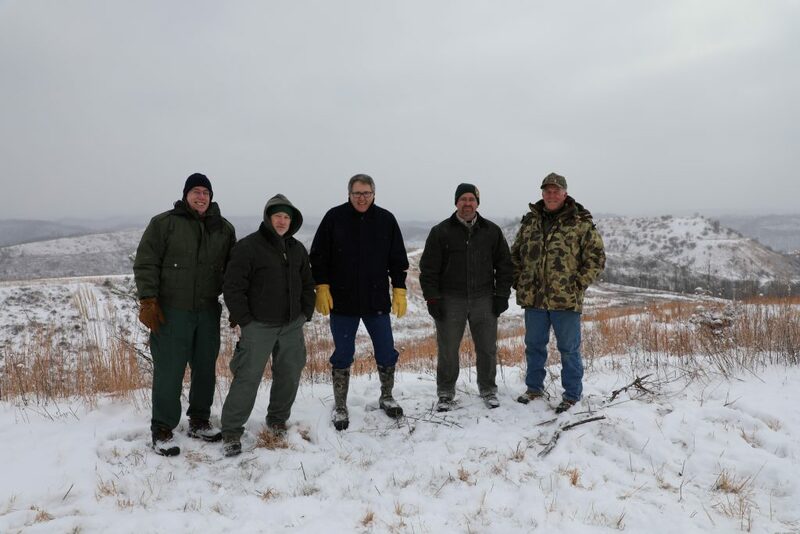 The state quail coordinators in Texas, Oklahoma, Kansas and Nebraska… Robert Perez, Derek Wiley, Jeff Prendergast and Jeff Lusk, respectively. All of the ranchers: Linda Evans, Jerry Hunter, Cody Sander, Ted Alexander, Brian Alexander, Tom Carr and Greg Hurlbut. Crew of many others: Alex Lyon, Kansas Department of Wildlife, Parks and Tourism (KDWPT); Allen Wilson and Reading Benefit Fire District, KS; Ken Brunson, The Nature Conservancy-Kansas; Barth Crouch, Kansas Grazing Lands Coalition; Craig Woods; Oklahoma State University (OSU); Russel Stevens, Noble Research Institute; Blayr Gourley, OSU; Chris Schenck, Texas Parks and Wildlife Department (TPWD) ; Kyle Banowsky, TPWD; Carol Baldwin, Great Plains Fire Science Exchange, Kansas State University (KSU); Aleksey Sheshukov, KSU; Tom Gross, KSU; Dan Donnert, KSU; Eva Horne, KSU; John Weir, OSU; David Engle, OSU; Brian Teeter, Pheasants Forever/Quail Forever; Alva Gregory, Oklahoma Department of Wildlife Conservation; Mike Remund, Nebraska Game & Parks Commission; Chuck Stanley, Natural Resources Conservation Service; Troy Smith, KDWPT; Society for Range Management; NBCI staff. I hope I got everybody. Thank you! The Native Grass Gazette: Ready, Set, BURN!!! 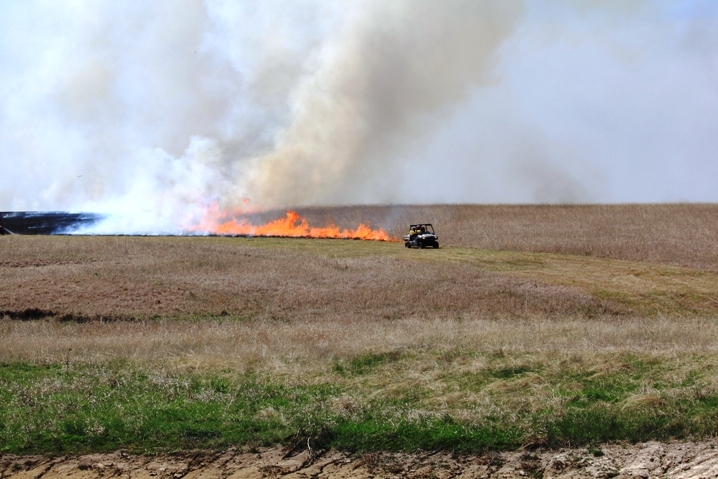 Prescribed burning in grasslands during the growing season as a management practice has been quietly taking place for a number of years, primarily by out-of-the-box thinking land managers. It is only recently that researchers have been looking at the practice and others are beginning to take notice. I suppose you could say it is in the early adoption phase. Many are skeptical that a burn can be conducted during the growing season. After all, how can something that green burn? What about fuel moisture and the humidity? Typically, those are higher than what we normally conduct burns under. Then there are others concerned about the loss or damage to flora or fauna, and while those concerns are warranted, if the burn is planned and implemented properly, those impacts are minimal. First, as long as there is residual dead material from previous years’ growth, lush, green native grasses will burn during the growing season. Surprisingly well, in fact. The key is enough residual old growth to be fuel for the fire. Without that, it won’t burn – except under extreme circumstances under which you shouldn’t be conducting a prescribed burn anyway. Second, fuel moisture is much higher in the new green growth but fuel moisture in the dead residual material is much lower, though not as dry as during the dormant season; humidity varies greatly from west to east and relative to rainfall zones but is usually higher than during the dormant season as well. These two factors combined actually make growing season burning safer and less work than dormant season burns because the fire is less volatile, much slower moving and easier to extinguish. Finally, to address the potential loss or damage to flora and fauna, burn only a portion of the total area within the field or planning unit. While burning during the growing season will damage some plants and animals, if areas are left unburned, they will serve as refuges, thus not eliminating entire populations of susceptible species and providing sources to repopulate the burned area. I will provide a personal example of how growing season burning can create biodiversity. I don’t recall exactly when, but somewhere around 2000 I decided to try a growing season burn on an old big bluestem seed production field that was no longer productive. I conducted the burn in late July. The first thing I noted was the regrowth the bluestem put on after the burn. Within just a few days, bluestem shoots were emerging from the ground and by the time of our first frost plants were 12 – 18 inches tall. From the bobwhite management perspective, this is an ideal height for nesting cover the next spring and the residual leaves can provide nest building material. The following summer I saw a number of different forbs begin to show up, ones which I’d never noted before. The balance of grasses to forbs was shifting. After several years of growing season burns the area is now a mixture of grass and forbs with about a 50:50 ratio of the two. Recent research supports my unscientific observations. Researchers are finding nearly two times the plant biodiversity in growing season burned plots compared to unburned and even traditional spring burned. They are also finding more insect abundance. June is a good time to start planning your growing season burns, in preparation for late July or August. If planning to burn CRP as a mid-contract management practice be sure to check with your state about the primary nesting season dates and be sure to burn outside of those. 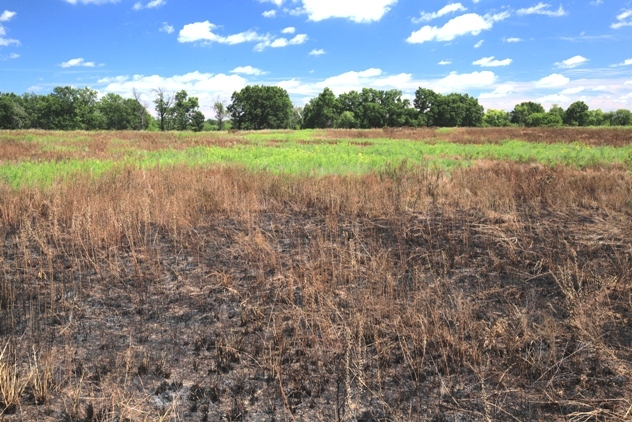 If not burning CRP, burning can be conducted anytime, just be sure to leave unburned areas as refuges. NOTE: there is always concern about destroying or disrupting bobwhite or other grassland bird nests with growing season burns. Weigh the risks against the benefits when deciding when to burn, keeping current habitat condition in context. If the grasses are thick and rank with lots of accumulated litter, odds are against quail nests or broods being present, whereas newly burned areas will provide ideal nesting in the future. You should also prepare your fire guards. If mowing, mow them regularly to keep them functional. Fire guards mowed a few days before the burn don’t function very well; duff from the mower is likely to carry fire. Bare dirt fire guards left idle can grow up in annual plants, providing brood cover and high energy food sources later in the season. Growing season burns are easy to control and take minimal effort for those involved, however, it is important to recognize that heat can be an issue and everyone involved needs to stay hydrated and aware of their physical wellbeing. Growing season burns spread out the workload and allow for more burn days in a year instead of trying to pack all your burns into a 6 to 8 week spring burn season, thus increasing capacity. Growing season burns are very, very smoky. Smoke management is extremely important. Growing season burns are slow. Allow 2 to 4 times as much time to complete burns as with similar sized dormant season burns. Growing season burns when timed just before seed set can suppress sericea lespedeza and limit its spread. Growing season burns provide good woody plant control. Growing season burns provide spikes in forage crude protein just as burning does with spring burned native pastures. There are many benefits to growing season burns, but also a number of precautions. Consider each on their own merit, weigh your objectives and begin planning your growing season burn. 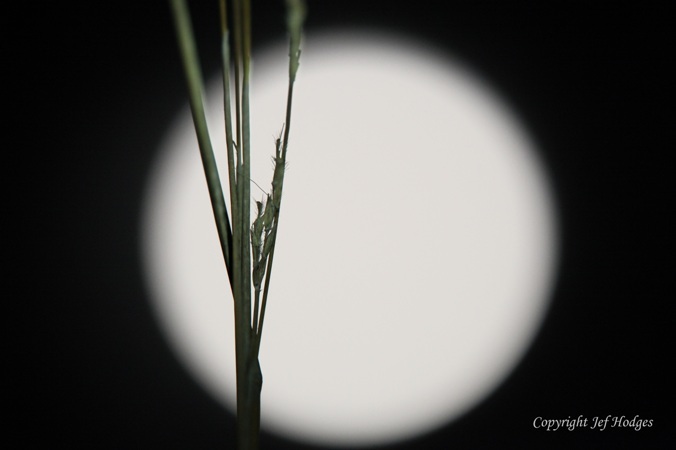 Native Grass Gazette: NatiVeg – Helpful Tool or Curious Tchotchke? I hate answers that begin with “it depends.” That usually means you are about to be inundated with tons of detailed, probably useless information which ultimately ends up with no clear answer to your question. So, is NatiVeg a helpful tool or just a curious tchotchke? As much as it pains me to say this, it depends. How are you going to use it and what do you expect to get out of it? First, for those not familiar, NatiVeg is a mobile website (https://www.quailcount.org/NatiVeg) developed by NBCI to aid planners in selecting the correct native vegetation for their geographic location (limited to the 25 NBCI states) for their intended use. Released publically for comment on Nov. 16, 2016, NatiVeg can be used either as a desktop application or with a smartphone with GPS capability. An internet connection is required. Many land planners dealing with working lands have limited knowledge of native vegetation, let alone its adaptability to a specific site or for specific purposes. NatiVeg was developed to provide planners with no or limited knowledge of native vegetation a tool for identifying native vegetation adapted to their selected location for their selected use. The target audience is persons providing technical assistance to landowners and/or landowners with the primary objective of incorporating native vegetation into their working lands. NatiVeg uses Plant Hardiness Zones (PHZ) and Major Land Resource Areas (MLRA) as spatial components for search criteria of a database of Natural Resource Conservation Service Plant Material Center (NRCS-PMC) releases. NatiVeg returns a list of species known to be adapted to your selected geographic location. Herein lies the answer to the question of whether NatiVeg is helpful or a curious tchotchke. Plant materials in the NRCS-PMC database have been through a process to document a variety of criteria, depending upon the intent of the release. In a majority of cases seed is commercially available or foundation seed is available for commercial increase, many of the releases have been planted in growing trials and their area of adaptation is documented, cultivars and selections have been made for desirable characteristics and there are some areas where local germplasm releases have been made with no selection criteria. (Both of those last two attributes are either good or bad depending upon your intended use and location) However, there are some limitations to the NRCS-PMC database; there are a limited number of releases (306 in the NBCI modified database) compared to a list of species that would have historically occurred for a location and there is skewed geographic distribution of native species releases, leaving limited choices for selected areas within the NBCI states. MLRA’s are large geographic areas that are geographically associated land resource units based upon the dominant physical characteristics using physiology, geology, climate, water, soils, biological resources and land use, and they are thousands of acres in size. 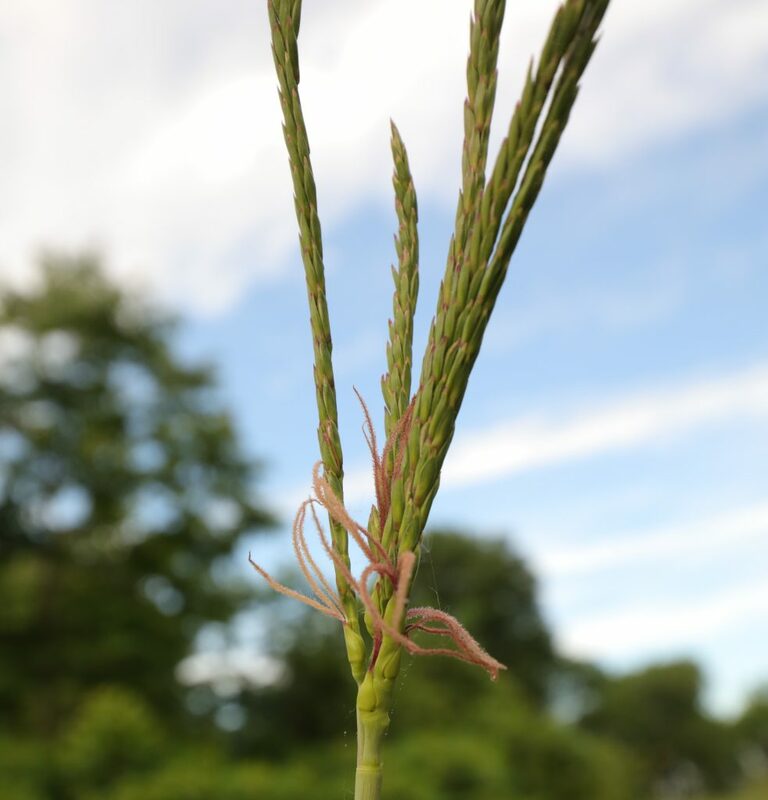 Obviously, there is variability within these areas, so though you may be in an MLRA where little bluestem is adapted, your specific location may be mesic or wet mesic and not suitable for little bluestem. For that reason, it is also important to consult the “Details” section of each species in NatiVeg to determine its appropriateness for the site. Information about collection location, comments or site adaptations can provide additional information to aid in decision making. If you still have questions or would like help there is a link to the state agency to help you find local assistance. What about our non-target audience? Since the launch of NatiVeg I have received several comments from ecologists wishing the application were more specific in relation to local ecosystems and vegetation communities. Fair comments, though those changes wouldn’t particularly serve our target audience any better. Remember a few lines above where I was listing the attributes of using the NRCS-PMC database; “There are some areas where local germplasm releases have been made with no selection criteria?” In some areas within the NBCI states there have been ecotype collections made and seed increases done. South Texas and Iowa/Missouri are two examples. Ecologists working in those regions will find plant materials suitable for restorations. Unfortunately, there is limited species availability and our database returns still don’t give a “big picture” list of species endemic to the location. We are working on ideas to address this and determine if we even need to. It appears, based upon feedback, there is some need/desire for this type of product. At this point we don’t know if we will develop an entirely new product or work to expand NatiVeg, but we are examining options using NatureServe data or NRCS Ecological Site Description data. There may be others and we’ll examine all options. Knowing some of the limitations of the database and spatial criteria, and understanding how to use additional resources to deal with those limitations, NatiVeg should be a helpful tool for our target audience … and in some instances our non-target audience. If you’re expecting a list of species endemic to your local ecosystem, then NatiVeg is probably a curious tchotchke. To answer the question,” Is NatiVeg a helpful tool or curious tchotchke?” It depends. Hardwoods get all the attention this time of year for their fall color but ask me and I say the prairies are just as colorful. The full moon on November 14th, which coincided with perigee, resulted in the closest supermoon since 1948 promised to provide some excellent opportunity for lunar photographs. I set up in a prairie planting in anticipation of the rare event, hoping to capture some once in a lifetime images. Unfortunately, clouds obscured much of the moon that evening in my location. What do you do when you are all set up with camera gear then can’t get the conditions you want? You take pictures anyway. Here are some of the shots I took. 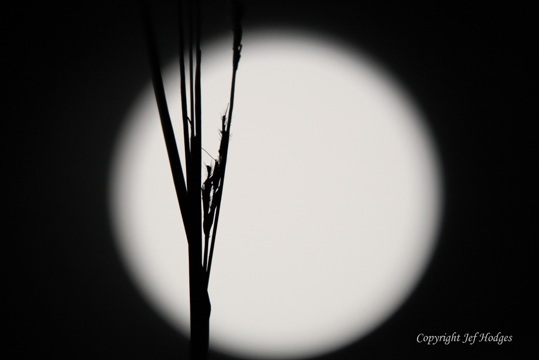 I used the moon to silhouette a senescing stem of big bluestem. After taking this shot I wondered how different it would look if the bluestem were illuminated. I can’t decide which one I like best. What do you think? After taking this shot I decided to experiment with a technique called light painting, where you use a light source to illuminate the foreground while the exposure is being made. You can come up with some interesting results using this technique. 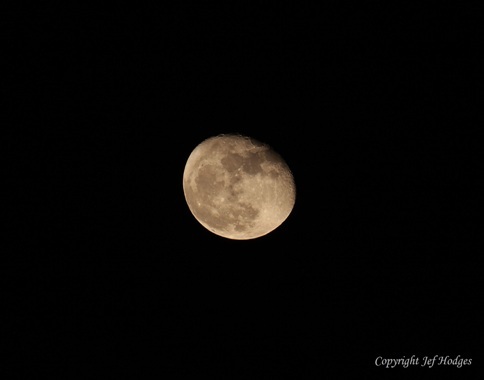 Not to be denied a lunar image, a couple of nights later, under clear skies, I got a shot of the waning gibbous moon. It’s not the supermoon, but it’s pretty good. I call it Perigee Minus 2. Don’t let the weather keep you out of the prairies. Get out there and enjoy their beauty, regardless of the conditions there is always something picture worthy.